Here is a gorgeous metal art gate with FACTORY-DIRECT PRICING. Regularly $1600, we offer this gate at a great factory-direct price for ONLY $999. This is a beautiful nautical motif with a dolphin, mermaid, seahorse and fish. Sit by you lovely gate and enjoy. 1. Rough opening: 36". Rough opening holds the gate, posts and hinges installed. Height: 72". The design in this listing will be fabricated in this size. 4. Fabricated with one or two standard 2 1/8" holes for standard lever/lock. Customer supplies lever/lock. 5. Includes posts to attach to side walls. Posts: Steel 1.5" x 1.5" square. Customer decides hinge side and gate swing. 7. Includes sandblasting, baked on zinc primer and standard powder coating. Several standard colors available. Custom Black Hammer. This is a dark black powder coating. Medium gloss. Delicate hammered finish. $175 value free. Makes the gate stand out. Custom Textured Black. This is a dark black powder coating. Semi-gloss. Delicate sand finish. $175 value free. More subtle color. Please allow 15 business days for shipping. Each gate is custom fabricated per order. 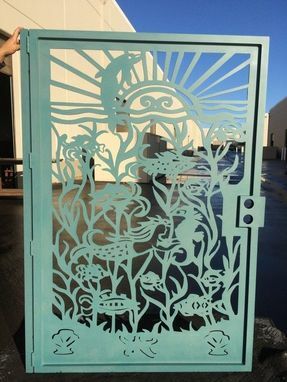 You cannot find a gate like this at your local hardware store!